The GoProHERO Adventure package makes it easy to capture your memories and share your world! Featuring high-quality 1080p30fpsand 720p60fpsvideo, the HERO captures the same immersive footage that's made GoProone of the best-selling cameras in the world. Whether above or below the surface of the water, our adventure package allows you to record exceptional footage in any environment all around the globe! Waikiki Camera can deliver anywhere in Waikiki such as your Hotel front desk or vacation rental. We have a courier service that goes out twice per day. Included is a FedEx label for easy returns. The package will come in a convenience travel case. Telephone and email technical support is available. 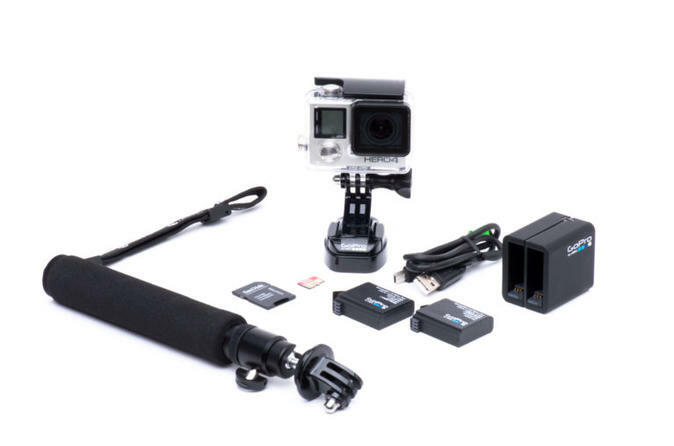 You're going to have a great time with our GoPro HERO 4 rental. The package includes the following items with every rental.